Our Solar Ground Light: 8 led bulbs, create wider and brighter lighting for you. Our Solar Ground Light:600mAh 18650 lithium battery, large capacity, extend working time, more convenient and more stable. leave it in your garden and it will automatically on when dark falls and off in the morning. 3.Please ensure the ground lights are switched on before take them out to gather solar energy. 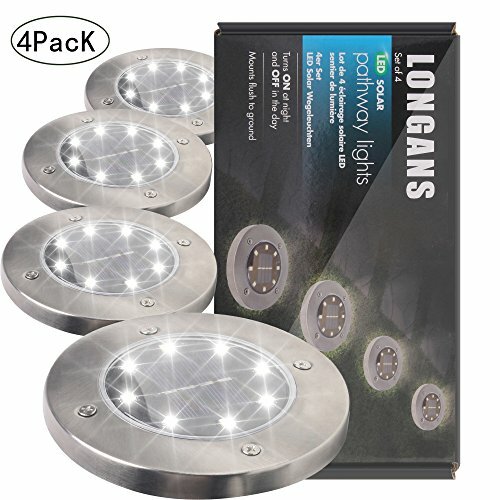 ☀UPGRADED DESIGN: Part of the body using high quality aluminum alloy material with the anodizing process, which makes the product not only exquisite and classy but also more WATERPROOF (IP67 waterproof grade) and DURABLE than similar solar lights, withstands inclement weather and 100KG standing body. ☀IMPRESSIVELY BRIGHT: The product uses 8 LED Bulbs, the illumination range and effect is bigger and brighter. It can be mounted on your driveway, pathway, sidewalk and other areas of your lawn, yard to help to illuminate your path, not just making it safer, but also adds a beautiful scene to the night view after dark. ☀EFFICIENT: Our upgraded solar lights with built-in 600 mAh large-capacity 18650 lithium rechargeable battery, can light up for 8 Hrs after fully charged, maintaining a continuous and well illumination even though on occasional rainy days and cloudy days. ☀SOLAR PANEL: Our solar panel size is about 5.4 square inches, in normal sunlight, you can charge the power 120mA per hour. Our Solar Lights greatly improve the efficiency of light energy conversion, which could receive and store more solar energy . If you have any questions about this product by Longans, contact us by completing and submitting the form below. If you are looking for a specif part number, please include it with your message.